A log cabin set near the town of Newport in Shropshire, sleeping two people in one bedroom. 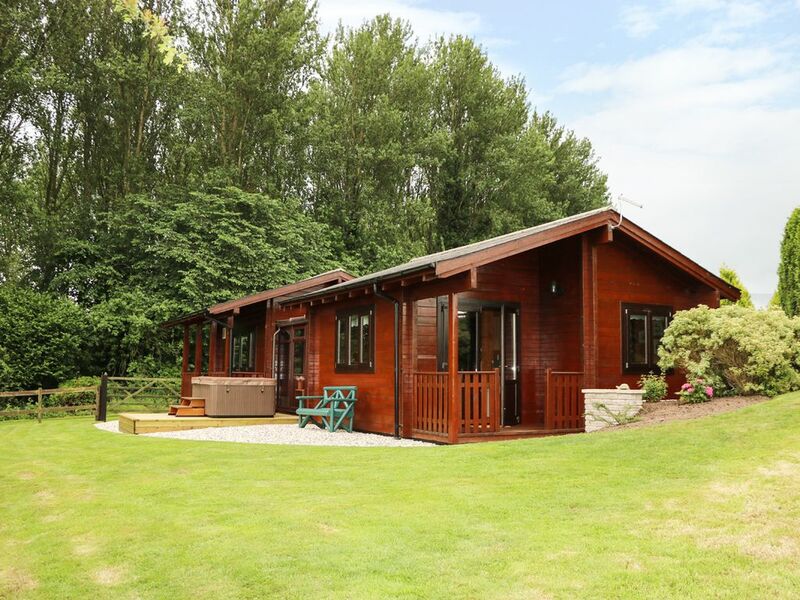 Lynn Croft Lodge is a lovely little one-bed chalet overlooking the Shropshire countryside just outside of the town of Newport. The chalet sleeps two people and has one double bedroom, an en-suite shower room, summer room, and an open plan kitchenette, sitting room and dining area. Outside is a lawned area and a patio with furniture, as well as a two-person hot tub. There is off road parking for two cars. Located a 15-minute walk from the local pub, and 5 miles from Newport town. Lynn Croft Lodge is a great couple's retreat at any time of year. Amenities: Electric heating. Mini oven with hob on the top and a microwave ( not a combination microwave ), fridge, TV with Freeview, WiFi. Fuel and power inc. in rent. Bed linen and towels inc. in rent. Off road parking for 2 cars. Lawned garden with patio, hot tub and furniture. Sorry, no pets and no smoking. Shop 2.5 miles and pub 1 mile. Note: The shop and the bus station are in Newport 4 miles away. Note: The pub is approximately 15 minutes walk across the fields. Town: Newport is a town in the borough of Telford and Wrekin in Shropshire. It lies 6 miles north of Telford and 12 miles from Stafford. There is a range of pubs and wine bars on the high street as well as an indoor market. There are opportunities for walking on the Millennium walkway as well as cycling on the Sustrans National Cycle Network. Shrewsbury has over 600 listed buildings, offering a selection of shops, along with cafés, bars, restaurants and pubs. Shrewsbury boasts places to visit including its abbey and castle. Electric heating. Mini oven with hob on the top and a microwave ( not a combination microwave ), fridge, TV with Freeview, WiFi. Fuel and power inc. in rent. Bed linen and towels inc. in rent. Off road parking for 2 cars. Lawned garden with patio, hot tub and furniture. Sorry, no pets and no smoking. Shop 2.5 miles and pub 1 mile. Note: The shop and the bus station are in Newport 4 miles away. Note: The pub is approximately 15 minutes walk across the fields.